Not knowing what to expect, as I generally don’t research much for my journeys. Leaving it as a surprise 😮 I do though research the climate (wind direction🌬), along with the flora and fauna. But knowing what’s round the corner, defeats the object for me! These are well thought out and worth the money. As the trail is free i.e. not paying for the use of the huts etc., I felt it only right to purchase the Munda Biddi maps from the Munda Biddi Trail Foundation. I think the total cost was 80 🇦🇺 $. In hindsight, one could cycle the trail just by following the excellent little markers that are abundant. But the maps still had there use and it’s good to offer something back. No shortage of markers on the trail. I wasn’t familiar with the huts and what they’d be like. Again, zip research! I couldn’t believe it when I saw the first one 😃 Seriously, in any other country they’d be a warden/ranger/jobs worth looming round, demanding money or looking for a prepaid ticket. All the huts are of a corrugated construction, open on two sides, with births inside to sleep upwards of six to ten people plus. Along with each hut consisting of two, rainwater 🌧 collection tanks at 1,000 gallons each. Not one tank was ever under 90%. But I’m cycling in November and December, so not fully into the dryer summer months. Rain water runs off the corrugated roofs into gulleys directed through the sealed tops of the tanks. Absolutely no waste. Brilliant. I’d drop a Chlorine tab into a 1-litre water bottle. Job done! 1000 gallon tanks x 2 at each hut. On some sections of the trail, huts are interspersed with small towns. Accommodation or camping sites are routinely available, along with supply stores/shops. Every so often I’d hit a town, stock up with supplies and water, then head out the other side and search for a ‘real’ wild camping location, when huts weren’t near by. All huts had a ‘long-drop’ toilet 💩 Bring your own paper, though. A 'Dunny' as the Aussies say! As I was cycling early in the season, only on two occasions was there anyone else in a hut. Very quiet! With that, I barely saw a handful of other riders on the trail north/south, south/north over the whole 1,000 + km’s. The trail itself consisted of mainly pea-gravel in various guises! Throw in an abundance of Honky Nuts … you’ll be having fun! You'll become friends with this stuff or not! The terrain varied from the vertical ascending, to days of just rolling terrain. Remember, this is a mountain bicycle trail ‘MTB’ and not a Sunday afternoon leisurely cycle-way. Those sections are there, but it’s predominantly a single-track MTB route. It’s advisable to follow the Parks and Wildlife 🌄 website for their wildfire alert system. If sections of the trail are closed for any reason, you’ll discover it well signposted for the detour. Detours are well marked out. 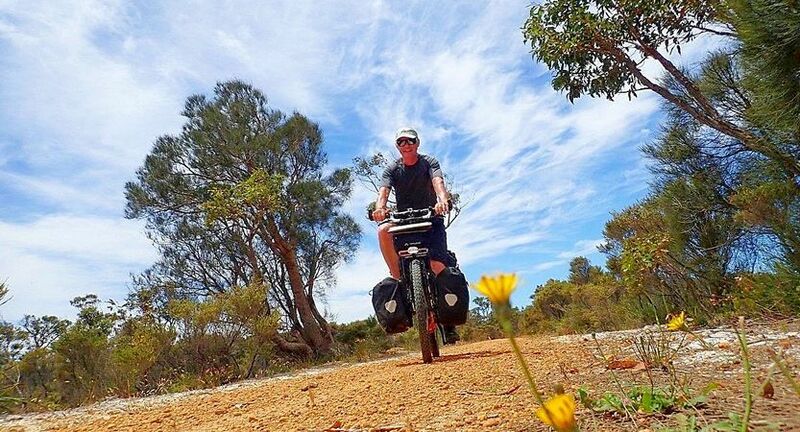 Don’t be fooled into thinking you need a ‘bikepacking’ setup as it’s all the rage! I did it easily with a ladened-expedition-framed-bicycle Thorn Sherpa (all steel). I carry a two person tent MSR Hubba Hubba and a comfortable sleeping mat Exped SynMat 7. I enjoy my rest days. I like rest days as much as I enjoy cycling days 🚴‍♂️ Don’t fret about weight, remember, 80% of the bicycle weight is already you! Why Hurry? My Munda Biddi finished in Walpole via Denmark and the Heritage Trail (a loop for me). There’s a couple of huts I wished to return to and enjoy their serenity. So Albany will have to wait for another journey. Very rarely did I see any vehicles. Many thanks to the Munda Biddi Trail Foundation, Parks and Wildlife, all the volunteers who keep the trail serviceable and the trails main sponsor: Alcoa. I hope to return and undertake the journey from Albany to Mundaring one day. Considering I reside in the UK, that’s dedication! It shows, if you offer free activities for people to visit in a country, they’ll come. Or in my case, again and again! The map is interactive. Click on the route or icons for detail.